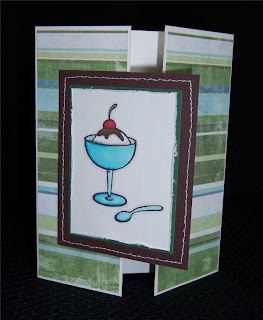 I looked at this week's sketch challenge on Splitcoaststampers and decided it would be fun to do a series of cards using the same stamp and the sketch. 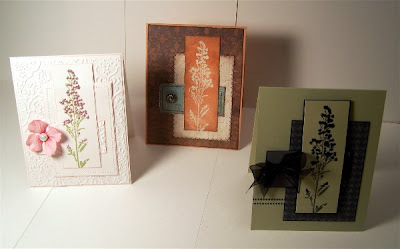 Here are the three cards I made last evening using the same flower image stamp from Rubber Stampede on each card and Sketch Challenge 169 from Splitcoaststampers. For the first card I stamped the flower with Olive Pastel Colorbox chalk ink and then added pastel raspberry liquid pearls to the flower. I used the textile cuttlebug embossing folder on a couple of the layers and sewed around the other layer. All of the white layers are matted with pink from Martha Stewart. The flower is a prima with a flat back pearl. 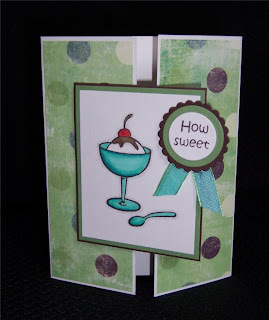 On the second card I started with a SU Groovy Guava base and used designer papers from the K & Co Ancestry collection. I added some stitching to the layers with my sewing machine and a faux brad (an upholstery tack with the back cut off). The flower image was stamped on white paper with versamark then heat embossed with clear embossing powder. Over the embossed image I brushed some pearl ex and reheated it to melt the pearl ex into the image. Once that had cooled, I inked up my brayer with Groovy Guava and ran that over the whole piece. I used some basic brown ink to sponge the edges of all of the layers and my Heidi Swapp edge distresser to distress the edges of a couple of the layers. 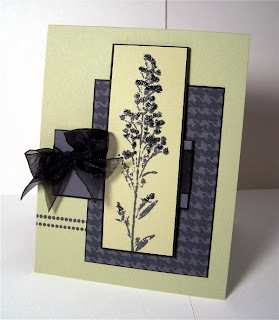 The last card for today uses SU River Rock, Basic Grey and Black. I stamped the flower with Charcoal Colorbox chalk ink on River Rock and the Houndstooth background with the same ink on Basic Grey card stock. I also added two rows of dots using a stamp from Papertrey Ink's Faux Ribbon set and the Charcoal Colorbox chalk ink. The ribbon is tied in a bow around the small panel and then for the finishing touch I added some black stickles to the flower. I think you can see them if you enlarge the photo. I had fun creating different looks with the same basic card design. If you decide to try it, leave me a comment so I can check out your work. Today I have a simple birthday card to share. I stamped the cupcake from Inque Boutique in Chestnut Roan chalk ink and then added the cherry to the top of each cupcake in Rouge chalk ink. I ended up using liquid pearls to cover the cherries and some of the sprinkles on the cupcakes. 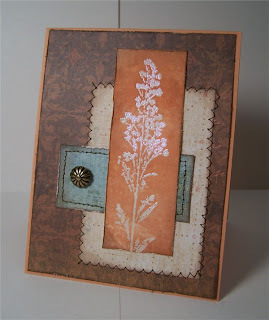 For the scalloped brown border I used my Stampin Up slit punch. I used my nestabilities to make the Happy Birthday tag and mounted it with dimensionals. The patterned paper is from My Minds Eye and the brown base is from my LSS. 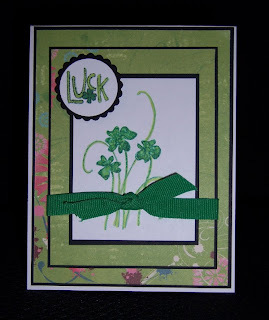 Here's a card for this weeks Rubbernecker Blogger Challenge (RBC02). The challenge is a color challenge using light brown or tan, red and light blue. I took a little liberty and added some green to my image (hope it's ok). 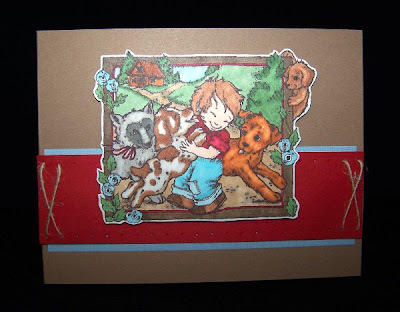 I used the Puppy Love stamp from the Stamp Oasis Fantasy group. 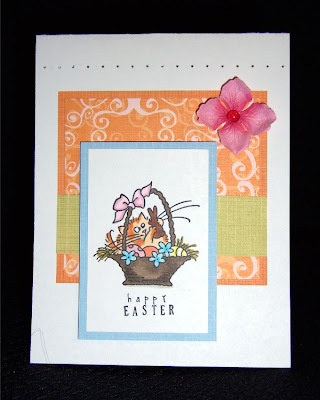 I stamped the image with Timber Brown stazon on white cardstock and colored it with my Copics. The card base is an unmarked brown from my local stamp store. I added some blue chatterbox paper and a strip of red. The edges of the red were paper pierced and some cord threaded though each end for a little detail. The image was cut out and mounted on pop dots. Check out Jeanne's blog for more info on the challenge. With not feeling well last week I never had a chance to upload my Easter cards so I thought I would go ahead and share them today even though Easter was yesterday. Hope you don't mind. 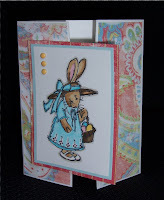 Here is just a simple gatefold card using the adorable bunny from Rubbernecker. I stamped her with Palette Hybrid black and colored her using my Copics. The paperclip in the photo on the right is just to hold the card closed for the photo. 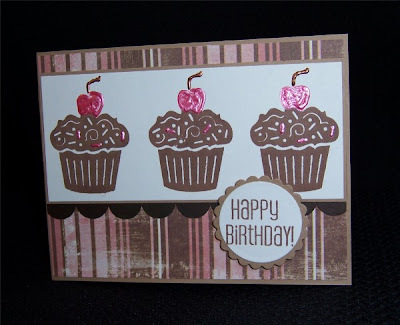 This card uses a CTMH stamp also stamped in Palette Hybrid black and colored with Copics. I added some lace ribbon to the bottom of the card along with a prima flower with a button center. After several hours on the sofa again yesterday I went down to my craft room and pulled out some more Rubbernecker stamps to make another challenge card. The card base is SU Very Vanilla. I inked the Stamp Oasis Bushed Lily stamp with SU Cool Caribbean and then used my Old Olive marker to ink over the leaves on the stamp. After I stamped it on Very Vanilla I pulled out my aqua brush and some reinkers (Creamy Caramel, Taken with Teal and Old Olive) and did a little watercoloring. I sponged the edges with Cool Caribbean and mounted it on Creamy Caramel. Then I added an olive mat and one strip of Chocolate under the image panel. 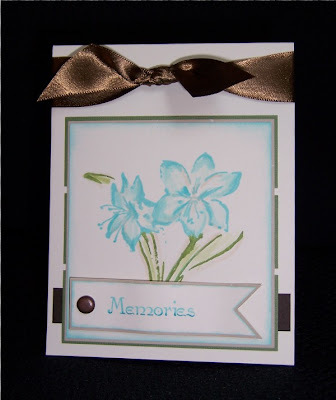 Finally I inked up the word Memories from the stamp - Memories keep those we love close forever - with Cool Caribbean and ran my Taken with Teal marker across the bottom before stamping. The edges of this piece are also sponged with Cool Caribbean and matted on Caramel. I added the larger brad to the tag and mounted it with pop dots. The final touch was the brown satin ribbon I found on clearance at Target. I'm still not feeling great (sinus issues and terrible cough) but I'm so glad I don't have the flu and some of the other things that seem to be going around. I'm hoping a few more evenings on the sofa and I'll be better. Thanks so much for stopping! I hope you're all having a fabulous day! 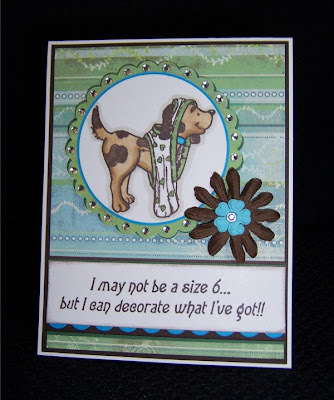 I'm still not feeling very good today but Jeanne posted a color challenge on her blog Inky Paws using Rubbernecker stamps so after laying on the couch for a few hours last night I dragged myself to my craft room to put a card together for the challenge. For details on the challenge see here. I pulled out my stamps and decided these two could work well together so here's what I came up with. The base is white with a layer of chocolate (PaperSource), the background paper is BasicGrey Two Scoops. The turquoise is from a scrap that was on my table. I stamped the dog and verse in Timber Brown Stazon and colored the dog with my Copics. I used my Marvy punches and Nestabilities for the circle layers. Then I added a crystal to each scallop to dress it up. The brown flower is Bazzill Bitty Flower with a Prima flower in the center and a crystal. Thanks for stopping! I'm not feeling too great today so I just wanted to quickly post a couple of St Patrick's Day cards I made to send to friends. I used Gina K's idea for coloring on my stamp with Copic markers and sprizting them with alcohol before stamping. The shamrock stamp is an Autumn Leaves $1 stamp and the luck stamp is from Studio G. The papers for the card on the left are from the Colorbok Jewel pack. I also used my nestabilities for the luck tag and sewed around one of the layers. I used the same stamps for the card on the left but different colors and papers. The paper on this card is from Autumn Leaves. I did a little different layout for this card and added some ribbon. Here is a link to Gina K's copic/alcohol tutorial if you'd like to try it for yourself. I hope you all have a wonderful St Patrick's Day! 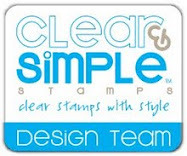 I'm really enjoying my new Gina K Designs stamps. They are such fun to color! 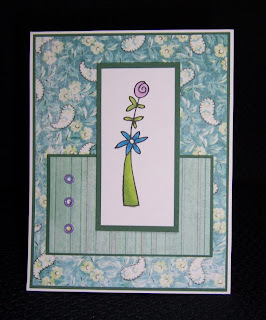 Here are a couple of simple cards using the vase of flowers from the "How Sweet it is!" set. The patterned papers are from Mind's Minds Eye Wild Asparagus collection. On the first card I added some square brads and on the second I used some eyelets. The images were stamped in Palette Hybrid black and colored with copics. The green is SU wild wasabi and the card bases are white. We've had above average temps here the last couple of days and it really makes it hard to go to work. On Wednesday when I got in my car to go home from work the thermometer on my car read 48 degrees! We haven't seen temps like that since early November. It was nice again yesterday which just made me want to stay home and take the dogs for a long leisurely walk. Hopefully the weather will stay nice all weekend so I can get outside and enjoy it. Thanks so much for stopping by. I hope you all have a great day! Sorry for the break in posts again. I had to go to Chicago for a funeral so I wasn't online for a few days. Then once I got back I had to try and get caught up so the blog postings suffered. I ended up driving to Chicago for the service so on the way home I made a little detour and stopped at Gina K's store and meet her in person. What a sweetie! And I just love her store (Gina K Design's). It would be great to be able to spend a day there stamping away. One of the sets I bought while I was in the store was her latest "stamps for a cause" set How Sweet it is! It's perfect for so many occasions and $7.00 of every set sold is divided evenly between The American Diabetes Association and the Juvenile Diabetes Foundation. When I returned home my new scor-pal was waiting for me so I had to make some gate fold cards with my new scor-pal and Gina K stamps! Here are the first couple of cards I made with the set. 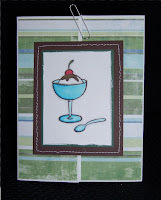 I stamped the sundae with timber brown stazon and colored it with my copics. 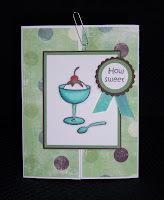 I used my nestabilities for the "how sweet" tag and some May Arts ribbon. The designer paper is from My Mind's Eye Wild Asparagus collection. Here's another view using a paperclip to hold the card closed. This card uses the same supplies except instead of any embellishments I just sewed around the brown mat. I'm sure this set with get a lot of use. As always, thanks for stopping! I ordered this fluffles stamp on sale last year and then I got an email that it was out of stock so they would issue store credit. When I found the stamp at a garage sale last summer I was very excited because I never did re-order the stamp or use my store credit because I didn't want to pay full price and shipping once it was back in stock. Anyway, my adorable fluffles easter basket stamp with the chocolate bunny has now seen ink! I made 6 of these little cuties to send to friends for Easter. I totally cased WaterPixie's version of SC164 on Splitcoast. 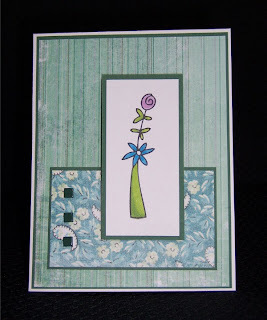 The designer papers are all from Chatterbox and the flower is from Prima. For the flower center I used a Dew Drop. 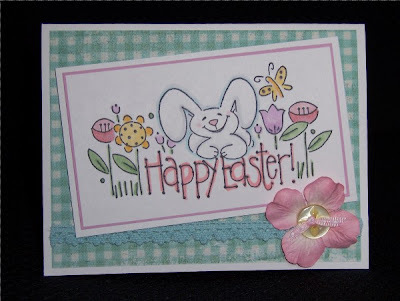 The fluffles stamp and Happy Easter are all stamped in Palette Hybrid black. 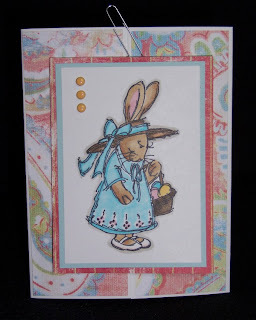 The Happy Easter are from discontinued Karen Foster Snap Stamps. Fluffles is colored with my copic markers. I hope you're having a fabulous week. Thanks for stopping. 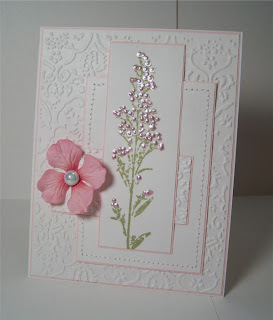 Did you see the fabulous card Julia Stainton made using a flower stamp, liquid applique and chalk . . . it's amazing. 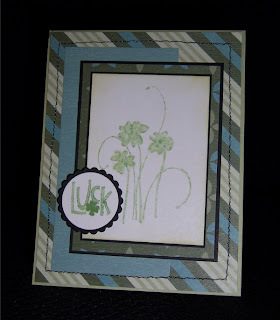 Here's a link to the card on her blog. I was inspired to try making a card using the bottle of liquid applique that I bought a couple of months ago and still hadn't opened. 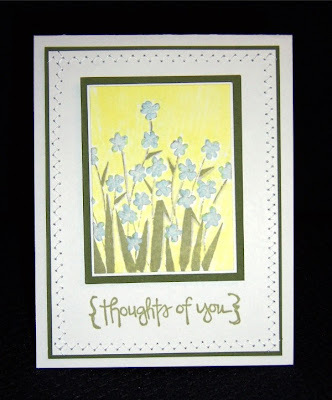 I used my Penny Black Fresh Fields stamped in Olive Pastel Colorbox Chalk ink on white cardstock. Then I painted all of the flowers with White Liquid Applique. After I "puffed" the liquid applique with my heat gun I brushed some pastel blue chalk over the flowers. I added some warm grey copic shadows and colored the background in with a pale yellow copic. For the matting, I went with white and olive green and stitched around the one set of mats for some extra detail. For the finishing touch I stamped the sentiment ($1 stamp from Michaels) in Olive Pastel. I love the texture the liquid applique gives to the flowers and using chalk to give it some color is perfect. Thanks for the great ideas Julia! I hope you all had a wonderful weekend. Thanks for stopping.